WE STOPPED THE CUTS! NYS members marched and rallied to save Medicaid. Close to 10,000 members of 1199 marched and rallied in Albany on March19 to protect Medicaid and Medicare from cuts driven by Donald Trumpâ&#x20AC;&#x2122;s tax cuts for the wealthy. See pages 8-11. 5 The President’s Column We need a NEW New Deal. 6 Around The Regions 1199ers celebrate Lunar New Year; MD/DC members support green jobs; celebrating Union women. 8 Stop The Cuts NYS members rally across the state to stop attacks on Medicaid. 12 PCA Blitz Building strength during contract negotiations in Massachusetts. 13 The Work We Do The NYS North Country’s Carthage Area Hospital and Claxton-Hepburn Medical Center. 16 PAC Victories Activists discuss the importance of building political action fund. 18 Our Delegates Joanne Rutland is social worker at Mount Sinai West in NYC. 19 Uniting to Save UMC Workers and community fight closure of stalwart D.C. hospital 20 What’s Cooking in Western NY? Homecare workers take culinary classes. 22 Our History The Crack of Dawn Brigade members helped build 1199. Editorial: Who's Got the Power? The drumbeat of division is no match for organized workers. D. Roosevelt’s historic New Deal was realized only with the support of a muscular labor movement. And today, around the nation, we see a host of newly elected progressives promoting worker friendly policies that bridge ever widening gaps. Though the forces trying to divide workers through our differences have a long (and sadly successful) history, workers know we have plenty in common: We all want an honest day's pay for an honest day's work, to support our families, have dependable healthcare and to one day retire in comfort. And as members on these pages show, contrary to conventional wisdom, we know how to do it: talk about it, mobilize and organize. 1199 Magazine is published six times a year—January/ February, March/ April, May/June, July/ August, September/ October, November/ December—for $15.00 per year by 1199SEIU, United Healthcare Workers East, 310 W. 43 St, New York, NY 10036. Periodicals postage paid at New York, NY, and at additional mailing offices. POSTMASTER: Send address changes to 1199 Magazine, 310 W. 43 St., New York, NY 10036. PORTABLE RETIREE BENEFITS? s a 35-year 1199 dues-paying member, I am concerned that if I choose to move out of NY State I will not have a secondary insurance to Medicare upon retirement. Many of our members move out of the state to warmer climates and should not be penalized for it. Even our brothers & sisters in New Jersey, CT, etc., have to pay for secondary coverage after they retire. It seems as though we are being penalized by the Benefit Fund withholding payment for our retirement benefit we so richly deserve. VICTORY: Thanks in part to 1199ers' efforts, New Yorkers with low incomes may now be eligible for 50% off subways and buses. Visit https://www1.nyc. gov/office-of-the-mayor/fairfares-nyc.page or call 311 to learn more. Monica D. Morgan Saint Luke’s Hospital Center, NYC 1199SEIU National Benefit and Pension Fund Executive Director Mitra Behroozi Responds: The Benefit Fund provides all eligible retirees with retiree health benefits to supplement their Medicare coverage, including prescription coverage. Additionally, we have been able to provide Medicare Advantage plans in areas where tens of thousands of our retirees live–the greater New York area and Florida–because we can leverage competitive rates for those retirees. While we would like to offer these plans to all retirees, there are not enough retired members living in every area to negotiate affordable prices. However, all retirees may enroll in their own low- or no-cost Medicare Advantage plan, and the Benefit Fund’s retiree health plan will cover the supplemental Medicare Part D prescription drug benefit. You can contact our Retiree Services Center at (646)473-8666 if you need help. 1199SEIU WESTCHESTER, HUDSON VALLEY, CAPITOL REGION: Congratulations! 1199SEIU at Catskill Regional Medical Center (CRMC) have spoken and by an overwhelming majority, voted to ratify a new contract—one of the best ever! This contract will improve the lives of CRMC workers and help them deliver the best possible quality care to their patients! and check out expanded, online versions of these stories. departments and offices charged with protecting workers’ health and rights. Additionally, employers would be required to recognize a union if a majority of workers in a workplace consent to representation; furnish contact information for every employee to the union; allow the union to present their case at the workplace in case of employeremployee disputes; allow workers who are discriminated against for union activity to sue for damages; allow unions to seek damages for costs and losses incurred when employers commit unfair labor practices; and require arbitration if six months after a union has been certified in the workplace no collective bargaining agreement can be reached. Eight decades ago FDR embraced labor law and pressed the U.S. Congress to respect workers. He did so because workers demanded it—in the streets, on their jobs, at the ballot box. Much has changed since then, but some things haven’t. In the 2020 elections and beyond, we need political leaders who are advocates and fighters on behalf of workers. And we need to organize and mobilize ourselves to demand that they do so. Best to get ready now. But so far, among the 2020 candidates, we haven’t yet heard any discussion about the rights of working people to organize and defend their families. NYC Members Celebrate International Women’s Day The 1199SEIU Women’s Caucus came together at 1199’s Manhattan headquarters on March 15 to mark International Women’s Day with a vibrant costume parade celebrating the Union’s diversity. Honoring “Women are the Heartbeat of the Nations,” the event celebrated a host of women’s achievements, including the record number of women becoming lawmakers both in Washington, D.C. and in the New York State Capitol in Albany. The evening’s keynote speaker was New York State Attorney General Letitia James, who made history as the first African-American woman elected to the office. “It was a ground-breaking, glass ceiling-shattering year in 2018. Don’t let this be a moment. Let this be a movement,” said James, “In 2020 we’re coming for the orange man.” Also, on the evening’s program was the presentation of the Audrey Smith-Campbell Awards, which recognize Union members and allies for their outstanding union work. The awards are named for the Audrey SmithCampbell, an 1199 activist who died of an acute asthma attack on her way to the picket line at Kingsbridge Heights Rehabilitation Care Center in the Bronx in 2008. This year’s winners were: Cynthia Sadler, a CNA at Downtown Brooklyn Nursing and Rehabilitation Center; Oksana Solilyak, an HHA from the Personal Touch agency, and Antoinette Rose, a Medical Records Analyst at Montefiore Medical Center. NYS Attorney General Letitia James was the keynote speaker at the March 15 International Women’s Day Celebration at Union HQ in NYC. 40 percent more polluted air and poor white Americans endure 27 percent heavier pollution than wealthy white Americans,” said Alexis, a RN and 1199SEIU delegate. “What a child looks like, where they live, and how much their parents make should not determine if they live.” Members also expressed their approval of the Maryland Healthy Green Amendment, which would add the right to a healthy, clean environment to the state constitution as a defense against the looming threat of climate change. 1199SEIU RN Phyllis Alexis testified before the Maryland State Senate about the importance of passing a Green Jobs Bill. ALBANY q Members rallying against healthcare budget cuts inside the NYS Capitol on March 19. The action helped restore full funding for the healthcare Transformation Fund, which helps fund collective bargaining agreements at many downstate NY nursing homes and hospitals. t P R E S BY NY Columbia-Presbyterian Medical Center rallied in freezing temperatures. Their determination helped win a robust New York State healthcare budget, which helps ensure accountability for Medicaid dollars among providers. p MONTEFIORE Montefiore Medical Center workers at a February rally fighting for health care in the Boogie Down Bronx. They helped win a NYS budget that includes an increase of $32 million to cover the uninsured and safety net patients. N O RT H W E L L â&#x20AC;&#x201C;L I J Northwell Healthâ&#x20AC;&#x2122;s Parker Jewish Rehab in Queens. The new budget they helped win includes a provision to study how staffing enhancements can improve patient safety in nursing homes and hospitals. B RO O K DA L E Brookldale members made sure BKLYN was heard, loud and clear. UTICA Members across Upstate NY brought serious heat to the budget fight with walk-ins, die-ins and demonstrations. p PCAs at March collective bargaining session in Quincy, MA. encouraged participation in political action programs. Ann Krebs, a PCA in Worcester, re-upped her Union membership during the blitz. She cares for her 17-year-old grandson, who has learning and developmental challenges. Union membership just makes sense, says Krebs. “It’s just logical. I worked for the state and I had a Union there. Why would I not belong to the Union as a PCA?,” she says. Krebs says Union membership and resources is vital for PCAs, who work independently and often alone with clients. “Sometimes PCAs need training. Some of us have high-needs consumers and you can’t get the kind of training you need everywhere all the time,” she says. “The fact that the Union helped get us [$15 an hour] is really a compliment to our Union strength,” she says. “And now we have to fight to get that even higher.” From Door-To-Door to the Bargaining Table At press time, PCAs had been three times to the bargaining table for contract negotiations. (Many of them fresh from the outreach blitz.) While the sessions yielded progress, workers were focused on a strong agreement that includes wage and healthcare improvements; provisions for more paid time off, additional training and clarity in job descriptions and responsibilities. Negotiating committee member Rosa Santiago, who works in Dorchester caring for her 83-year-old mother, says healthcare and secure benefits are vital to PCAs. Santiago has experienced homelessness and serious medical issues over the course of her PCA career. “What I make is not enough to pay for an apartment in the Boston area,” she says. “What I have been through is tough, so I know what we are fighting for. People around her might look at me and never think I have been homeless. It’s great that we are strong in our bargaining with the state. We need our Union and we need better wages.” For more information click on www.1199SEIU.org.  Anestine Bentick, a PCA at South Boston Community, makes involvement in political action a priority in her delegate duties. Our Delegates: Social Worker Joanne Rutland Service to others is a family value. Social Worker at Mount Sinai West in NYC. "You have to have compassion and understanding. You have to be aware of the struggle and indifference people have experienced. If you touch one person, you have made a difference." 1199ers lead the fight to save vital Washington, D.C., medical center.  Unit Secretary Tony Powell is among the 1199ers fighting for the life of United Medical Center in the Greater Southeast neighborhood of Washington, D.C. Upstate New York Caregivers Stir the Pot Buffalo-area cooking classes promote health and develop professional skills. York, even though cities like Buffalo and Niagara Falls are surrounded by much of the New York farmland where fruit and vegetables are grown and harvested. 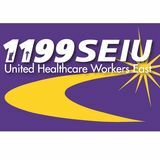 Healthcare Workers Rising (HCWR), a movement of healthcare workers in Northwestern New York, is addressing the problem while coming together with the support of 1199SEIU, to improve professional standards and communities.  Homecare workers who are part of Healthcare Workers Rising (HCWR), an Upstate New York movement of homecare workers, participated in cooking classes. The classes are part of a larger module of skills-building programs offered through HCWR. Was Key Ingredient in Historic 1959 Victory Pharmacy workers went the extra mile. This year marks the 60th anniversary of 1199’s emergence as New York’s major healthcare union. The saga began with a resounding Dec. 30, 1958, victory of a 5,000-member pharmacy Union at Montefiore Hospital in the Bronx. But it was in 1959 when the workers won their first contract and 1199 undertook the daunting task of organizing 3,500 maintenance and service workers at seven private, nonprofit hospitals. The hospitals, led by some of the most powerful and wealthy New Yorkers, were Mount Sinai, Beth Israel, Lenox Hill, Flower-Fifth Ave. and Beth David (the latter two have since closed) in Manhattan; Bronx (now BronxCare Health System); and Brooklyn Jewish (now Interfaith). The workers were among the city’s most exploited. Most earned about $32 a week with no benefits and often horrendous working conditions. The media characterized the campaign as David versus Goliath. Hospitals were exempt from labor laws because they were considered charitable organizations. And the great majority of unions were reluctant to organize poverty-wage workers, most of whom were women of color. But pundits and management of the hospitals greatly underestimated 1199. They assumed the campaign would sputter because they doubted that the workers could endure a protracted strike.  Early morning “Crack of Dawn Brigades” drafted from 1199’s staff and delegate body, were central to the Union’s 1959 organizing campaign. The Work We Do: Our North Country Caregivers Head Cook Steve Rookey has worked at Claxton-Hepburn Medical Center in Ogdensburg, NY for 17 years. See story on pages 13-15. 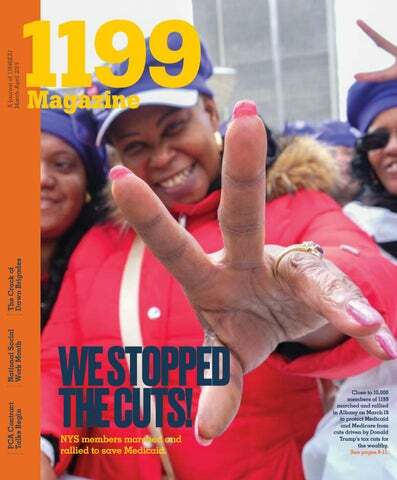 1199 Magazine | March / April 2019 We Stopped The Cuts!